For many years I was a member of The Secret Recipe Club, and of course we all miss the excitement of posting our chosen recipe on the first Monday of the month. After the club ended, Sid came up with a nice idea: we would post our favorite recipe from the previous month. Not necessarily the most popular by views or comments, but our own favorite. So here I am to reveal my personal winner for December. Pistachio Creme Brûllée. I simply loved everything about this one! Yes, it calls for an ingredient that is not that easy to find (pistachio paste), but sometimes we need to fight through clouds to see the bright sun behind it. Sid opened the collection with her own favorite, a Gingered Cranberry Chutney Compote… mouth-watering! For the recipe and details about it, follow this link. Follow the link below to see the favorite recipes from my virtual friends. « HAPPY NEW YEAR IN MY KITCHEN! Both you and Wendy have me craving creme brulee. I have never made it, and now I really need to fix that. You know you can buy a cute torch at Williams Sonoma, right? (I use a huge sized torch from Phil, the thing is humongous). But I had to enable you, you know…. What a great idea to do this! Looks scrumptious! You can participate too, if you’d like! Thanks Sally, will drop you a line! You done it. I have to go and break out my little torch, I see Creme Brulee in my near future. Between you and Wendy… Thanks so much for doing a whole new post and linking to my First Monday Favorites at Sid’s Sea Palm Cooking. I think I’ll be looking for Pistachio Paste my next trip to the big city. Great mind Sally…..I love the addition of pistachio…going now to check this recipe out. 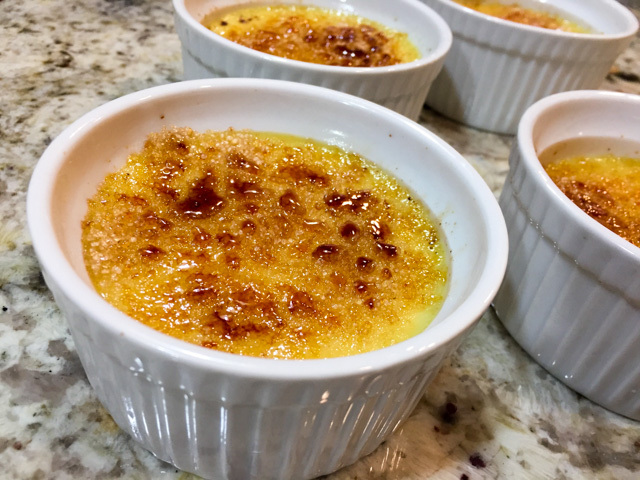 I haven’t made creme brulee for ages. I love it. Is there a better thing than whacking the hard sugar with a spoon? I think not. Pistachio paste – must have. exactly, breaking that crust is pure heaven! Oh soooo good, an utterly joyful blast from the past. I love pistachio in any form, so I must hunt down the paste. Or make some! I can see you coming up with amazing uses for pistachio paste… macarons? Oh, yeah…. Pistachio is a new creme bruilee flavor for me … I usually have vanilla or chocolate. Will have to try this! I love creame brûlée. I wonder if I could make pistachio paste in my Vitamix. Sounds like a great idea! Bring on the pistachio paste!!! You got a great crunchy delicious looking top on this!!!!! !